Flame Leviathan is a unique fight, as it is done entirely in Siege vehicles. This leads to many raids being very confused over how to handle the fight, having no idea what to do when engaging for the first time. Rest assured, if you give some time to read over these tactics, Flame Leviathan is a simple and fun fight. 1) THE LORE KEEPER: There will be a big Stone watcher in the middle of the group of Adventurers at the bottom of the stairs. Talking to this person will start the event in hard mode, activating all four hard mode towers. Your raid leader should be the only one to talk to this person. 2) BRANN BRONZEBEARD: Brann is off by the shield blocking your entrance into Ulduar. Talking to Brann will activate normal mode, leaving all four hard mode towers offline. Your raid leader should be the only one to talk to this person. Whether you talk to the Lore Keeper or Brann, when the event is begun, all vehicles will come online and you will be allowed to start piloting them. Do not leave the Base camp until everyone is grouped together and ready in their vehicles. Salvaged Siege Engine: This will be the large, armored tank at the west of the Base Camp. These vehicles will be essentially tanking Flame Leviathan and neutralizing his 'Flame Vents' ability. Siege Engines should have dedicated passengers. They can be selected by Flame Leviathan as targets. Salvaged Siege Engine Turret: The Siege engine also has a turret for it's passenger, who will be able to deal damage as well as apply a heavy shield to the Siege Engine to protect it from Flame Leviathan. Salvaged Demolisher: This will be the large, catapult-like wooden vehicle at the east of the Base Camp. 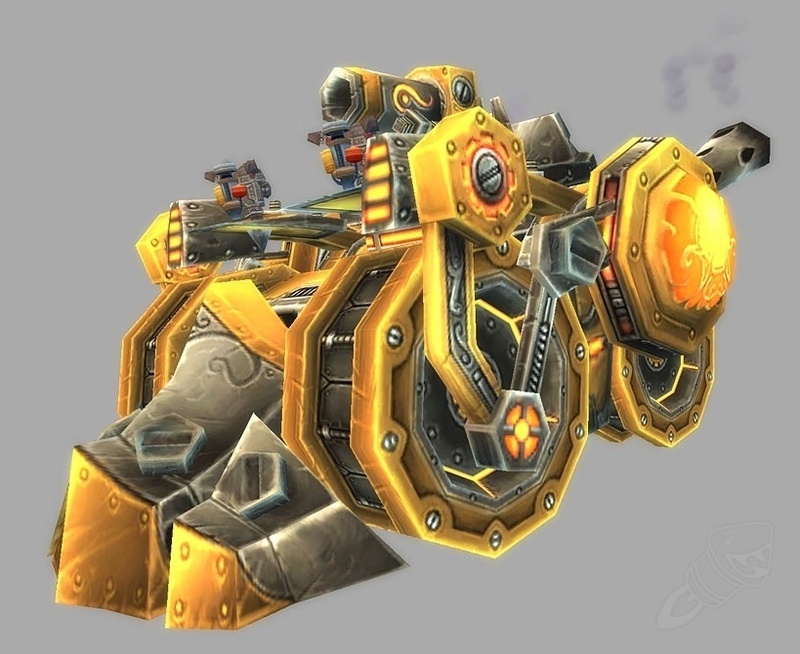 These vehicles are the Damage-dealers and will be doing the most harm to Flame Leviathan. Demolishers should have dedicated passengers. They can also be selected by Flame Leviathan as targets. Salvaged Demolisher Passenger: The Demolisher can carry a passenger that is able of restocking the Driver's ammo, boosting their speed, and Dealing Damage through a turret otherwise. The Passenger is also capable of launching himself onto Flame Leviathan. Salvaged Chopper: This will be the Motorcycles at the northern end of the Base Camp. These vehicles will be the support for the Demolishers and Siege Engines. They lay down tar to slow enemies, and the tar can be set on fire to deal additional damage. They are also able to pick up passengers and ammunition for Demolishers, but their passenger can do nothing while riding. The Chopper is able to do minimal damage itself. Choppers should not have dedicated passengers. The Choppers cannot be selected by Flame Leviathan as targets. Communication between Vehicles, and Drivers with their Passengers, is key to winning the fight against Flame Leviathan. keep this in mind when doing this fight. This is the Siege Engine's main source of damage, however it requires them to be up close to their target, which can be dangerous in certain situations. If you have the health and Steam Power to spare, use it for a nice big boost in DPS. Electroshock - [Costs 20 energy] Inflicts 8,489 to 8,951 Nature damage to enemies in a 25-yard cone in front of the Siege Engine. Interrupts spellcasting and silences the affected targets for 4 seconds. This ability is the most important ability that the Siege Engine has, as it neutralizes Flame Leviathan's "Flame Vents' ability. During Flame Leviathan's fight, All Siege Engines should save enough energy to cast Electroshock for Flame Vents. Notice that this ability is a cone in front of the vehicle, so you must be facing your target to interrupt it. Steam Rush - [Costs 40 energy] Increases movement speed by 100% for 4 seconds. Inflicts siege damage to enemies in front of the vehicle and knocks them back. This ability should be used constantly when being chased by Flame Leviathan, as a means to escape him. Otherwise, it has minimal use. Anti-Air Rocket - Fires an explosive missile that explodes on contact with air targets. This ability will shoot down flying enemies during the event, but will also take down Pyrite barrels in the air. It has no cooldown and no cost, and so should be used constantly to take down Pyrite Barrels for Demolishers. Fire Cannon - [Costs 20 energy] Fires a cannon blast, that inflicts AoE damage on impact. This ability will deal damage to ground enemies at the cost of energy. use it to deal damage to Flame Leviathan, as your Steam Power is seperate from your Driver's. Shield Generator - [1 minute cooldown] Places a shield around the Siege Engine for 5 seconds. The shield absorbs a limited amount of Physical, Frost, Fire and Arcane damage. This ability should only be used if Flame Leviathan is chasing your Driver, and is too close for comfort and dealing excess damage. Using this will save your driver much trouble, but it will also start the 1 minute cooldown. Hurl Boulder - Inflicts 27,000 to 33,000 damage in an area within 8 yards of the explosion. Main damage ability, costs no Pyrite to use. Hurl Pyrite Barrel - [Costs 10% Pyrite] Inflicts 54,000 to 66,000 Spellfire damage every 1 second, for 10 seconds through Blue Pyrite. Stacks up to 10 times. Deals considerably more damage, especially when stacked on an enemy, but costs 10% of total Pyrite. Should only use when your Passenger is able to restock you readily with Pyrite, or when Flame Leviathan is stunned and taking extra damage. If you are near victory, Using your pyrite will help speed it up, and if you need the extra damage it will be useful, but remember that this costs ammo that is lengthy to obtain for your passenger, who you may not have constantly. Use with caution, and make sure you keep in contact with your Passenger on reloading your ammo. Ram - Inflicts 19,000 to 21,000 damage to enemies in front of the Demolisher, knocking them back. Also deals 2,160 to 2,640 damage to buildings. Similar to the Siege Engine's Ram ability. Doesn't consume Pyrite, but the drawback to this ability is it requires you to be in melee range, which you should never be in unless Flame Leviathan is stunned. You should only use this ability if Flame Leviathan is stunned, as it allows you to go into melee range. Use with extreme caution, and never use it when Flame Leviathan is active. Throw Passenger - Launches the passenger into the air. Can be used to deport passengers on top of the Flame Leviathan. Available only if the passenger has used Load into Catapult. This ability is integral to the fight, especially for new raids, as it is essentially a quick way to make the fight vastly easier. So long as you are facing the general direction of Flame Leviathan when you use this ability, it will launch your Passenger, and auto-attach him to the Boss where he will be safe from harm and able to attack Flame Leviathan's turrets. If you destroy Flame Leviathan's turrets, he will shortout and be stunned for a few seconds, in addition to taking a good amount of additional damage from all attacks. This ability, while incredibly useful, will also have terrible reprecussions for you. Using this ability removes your Passenger, and you won't be able to get them back until Flame Leviathan is Stunned. This means that all your pyrite cannot be reloaded, and you cannot use a speed boost ability. If you conserve your Pyrite for when you have your Passenger, and when Flame Leviathan is stunned, the loss of your reload will not affect you too badly, although you will probably notice it. The real danger is the loss of your speed boost. Your Passenger is the only one able to give it to you, and if Flame Leviathan targets you when your Passenger is missing, you have no way of outrunning him, and can only flee and hopefully run through tar to slow him down. -Flame Leviathan has just switched targets, and has not targeted you. Doing this will ensure you have Pyrite to burn during the stun, and ample time for your Passenger to kill the turrets and return before Flame Leviathan switches targets and potentially attacks you. When Flame Leviathan is stunned, you should try to close in as fast as you can and pick up your Passenger ASAP. As soon as Flame Leviathan activates, if your passenger isn't in SOME vehicle, they will die. You should also take this time to use Pyrite barrels and ram if you are able to. Mortar - Does damage in targeted area. Deals basic damage to any enemy that isn't airborne. This will take out any Airborne enemy very fast. Use this to shoot down Pyrite barrels out of the sky, and take out any Choppers that appear during the Trash run before Flame Leviathan. Has little to no cooldown, so it can be spammed without worry. Grab Crate - Grabs a targeted crate of pyrite. This ability will allow you to pull in any pyrite canister that is ON THE GROUND. Airborne Pyrite needs to be shot down with Anti-Air first, before you can pull it in with this ability. It has a 50 yard range, so communicating with your driver where to go for you to pull in pyrite is a good idea. Increased Speed - Increases the movement speed of the Demolisher by 100% for 20 seconds. This is the speed boost ability that your Driver will rely on to escape Flame Leviathan if he targets you. If Flame Leviathan targets your Driver, you hit this ability and keep it up for the whole duration of the chase (Flame Leviathan chases you for 30 seconds, this has a 20 second duration for one hit). If you are in posession of excess nearby pyrite, you can also keep this up on your Driver just for a regular speed boost, and reload ammo from the Canisters nearby. Load into Catapult - Loads the passenger in the catapult, using them as an ammunition. Using this prevents the Demolisher from using any abilities but Throw Passenger. See the connected ability in the Demolisher Driver's section. To say it simply: Use this ability when you aren't targeted by Flame Leviathan and don't need to restock Pyrite on your driver. You'll be launched onto the Leviathan's top, and you need to take out the Turrets manually with your own abilities. do it as fast as possible, then get to your demolisher EXTREMELY fast, or else the Leviathan will kill you when he activates again. Speed Boost - [Costs 50 Energy] Increases movement speed by 100% for 5 seconds. Unlike the other vehicles, Flame Leviathan will not target you, and therefore this ability has no explicit use. Whenever you need to move fast, hit it. It takes some energy though. it's also extremely fast for a Chopper when you use this, don't underestimate it's usefulness when speed is required. Sonic Horn - [Costs 20 Energy] Inflicts 6,300 to 7,700 to enemies within 35 yard frontal cone. A basic damage abillity. Although, this should be used only as an additional damage to Flame Leviathan. The Main priority for Choppers is to lay tar down in front of the boss and protect any loose Raid Members. Tar - Drops a pool of tar behind the Chopper, that slows enemy units down. Tar can be ignited to inflict damage. This ability is vastly useful, as it slows down Flame Leviathan. Flame Leviathan is tanked through Kiting, so slowing him down makes tanking a lot easier. It also can be ignited to deal significant damage. Choppers should lay tar down in front of the boss whenever possible. First Aid Kit - Heals the passenger to full health in 4 seconds. Pyrite Pickup - The Chopper is capable of carrying Pyrite canisters that have fallen to the ground. This becomes very useful for in distress Demolishers. Usually, your Passenger seat is empty, and your tar is on cooldown. If you have the time, find nearby pyrite and pick it up, bring it to Demolishers, and then drop it off nearby so that they can reload. Missile Barrage - Inflicts 3,770 to 4,230 damage to several random vehicles. This ability means that throughout the fight there will be constant damage to all vehicles, and since you cannot repair any vehicles during the fight, it is essentially a soft enrage timer. It also means that any player not inside a vehicle during combat will be quickly killed. Flame Vents - Inflicts 3,000 Fire damage every 1 second to enemies within 50 yards of the caster. Lasts 10 seconds. This ability is a VERY dangerous one! There's only one counter to this ability, and that's the Steam Engine's interrupt. Steam Engines should interrupt this ability as FAST as possible. He casts this often, but having your engines prepared for it is vital. Battering Ram - Inflicts 100% weapon damage to the target, and applies a stackable debuff that increases damage taken by 50% for 20 seconds. Gathering Speed - Increases the Flame Leviathan's movement speed by 5% for 10 minutes, stacking up to 20 times. Overload Circuit resets the number of stacks back to 0. This ability will make tanking Flame Leviathan harder and harder throughout the fight, up to the point where he can easily close into your vehicles and attack them even when actively fleeing. This is also another reason to overload Flame Leviathan as often and fast as possible. Chopper tar will drastically reduce the damage this ability will cause to your tanks. Leviathan Defense Turret - The Flame Leviathan has 2 (25 Player: 4) Turrets that can be destroyed by passengers launched by a Demolisher's catapult. They attack with Searing Flame, which inflicts 425 to 575 Fire damage to a target on top of the boss. To Overload the Leviathan, all Turrets must be destroyed. Systems Shutdown stuns the Leviathan for 20 seconds and increases its damage taken by 50%. These turrets are the things that your Demolisher Passengers will be combatting manually when they're launched onto the Flame Leviathan. The damage they deal is ignorable, and they should be killed as fast as possible. Ranged DPS that are launched onto the Flame Leviathan are capable of attacking Turrets adjacent to theirs, and should do this. Your Highest DPS, and preferrably ranged-capable DPS, should be on the Demolisher Passenger seats, so as to cause overloads faster. Everyone else is free to pick vehicles they would like to pilot. Siege Engine passenger seats, and Choppers are usually the easiest for newcomers to the fight. As you come to Flame Leviathan's grounds, there are two blue circles on the ground by the entrance. Ride over these to repair your vehicles. these will NOT be available during the fight, and will be blocked off by a gate when the fight starts. Any Demolisher Driver or Siege Engine Driver should understand that if Flame Leviathan targets them, they need to turn and run away as fast as possible, staying out of melee range with the boss until he targets another vehicle. Demolisher Drivers: You should be using your Ranged attacks at all times when Flame Leviathan is active. Conserve your Pyrite for when you can reload it easily, or (more importantly) when Flame Leviathan is overloaded and taking extra damage. When your Passenger asks to be launched, if you are not being chased by Flame Leviathan, turn in the general direction of the boss and launch them as soon as possible. When Flame Leviathan is overloaded, use all your available Pyrite on him, and close in to pick up your Passenger again. If you get close enough, use Ram, but back away before he activates. Take this time to get extra pyrite, but be prepared to re-launch your passenger again soon. Demolisher Passengers: Your main priority should be keeping your Driver loaded on as much pyrite as possible, and launching yourself onto the boss and killing the Turrets as fast as you can. Only load yourself when your driver is doing okay on pyrite, and Flame Leviathan is not targetting your vehicle. When the Leviathan is stunned, you need to run as fast as possible to your demolisher and get inside before you're killed. Go to a chopper if you can't get there in time, and get in the chopper for safety. If Flame Leviathan targets your vehicle, use the speed boost ability and keep it up as long as is needed until Flame Leviathan switches targets. Siege Engine Drivers: You have one thing to worry about. But if you don't cover it, god help you. INTERRUPT. FLAME VENTS. ASAP. Besides that, run away when the Boss targets you, and use your steam rush as a speed boost if he gets too close. Ram for basic damage, but ALWAYS keep enough steam energy to use your interrupt, flame vents must be interrupted constantly. Siege Engine Passengers: Deal moderate damage with your cannon, take out Pyrite Barrels overhead with your Anti-air, and most importantly use the Shield ability when Flame Leviathan is chasing your driver and is too close for comfort. Choppers: Your first priority is to lay down tar in front of the boss as often as you can. Next, you need to be picking up Passengers that are not going to make it to their vehicles in time, and ferry them to their driver, or picking up loose Pyrite canisters and bringing them to a nearby Demolisher. After that, you can use your Sonic Horn to deal some slight damage to the boss. A good thing to note is, that when the Boss first enters the room, and every time he comes back online after a Stun phase, Siege Engines and Demolishers should back away, in preparation if they are selected as the tank. This will give you ample time to run away and not get hit by his opening melee. you will survive longer if you practice this. When it gets down to the wire, start unloading everything you have onto the boss and get him down as fast as possible.